Last week a friend mentioned that she had a red romaine as her fall planted lettuce and it was getting pretty big. She and her husband enjoy kale more than lettuce during the winter, so she’s not really concerned about having that lettuce into Spring. But her comment reminded me that it might help TMG readers who are lettuce lovers like me, to post a reminder about how to make sure to have a continual supply into spring. I’m enjoying lettuce from the garden a few weeks earlier this year because of the cooler temperatures this August. You may recall that my first planting disappeared after two days. Allowing the seedlings in the second planting to get bigger, was my key to success and those transplants are now thriving. Varieties currently in the garden are Black Seeded Simpson and Sierra Batavia (my favorite). Both are doing very well. I experimented with another of my favorites – Reine des Glaces – to see how it’d do in fall. A hard rain wiped out most of the 2 inch seedlings that were ready for transplanting. The couple of pieces in the garden are just sitting there. Will Covering Make Lettuce Last All Winter? If you’re new to gardening and/or lettuce it might be easy to think that you can just place row cover fabric or a hoop tunnel over any variety of lettuce in zones with cold winters and keep it going through Spring. Unfortunately, that outcome would probably be an exception rather than the rule. As beautiful and delicious as Sierra Batavia is in the fall, it doesn’t like the extreme cold. I had mine under two coverings last winter and the minute the temperatures dropped it declined quickly. A few pieces of the Black Seeded Simpson made it through nicely, but most didn’t. Although there are several varieties that are touted to do well (with protection) through the winter, I’ve found that Winter Density (a romaine) is THE one that holds up the best in my garden. Winter Density about the first of May after I’ve picked on it all winter. By the end of May the heads will be full grown. But variety alone is not enough. Succession Planting every two weeks or so will guarantee that you have lettuce in all stages and will be able to enjoy it through spring while your spring planted lettuce is starting. 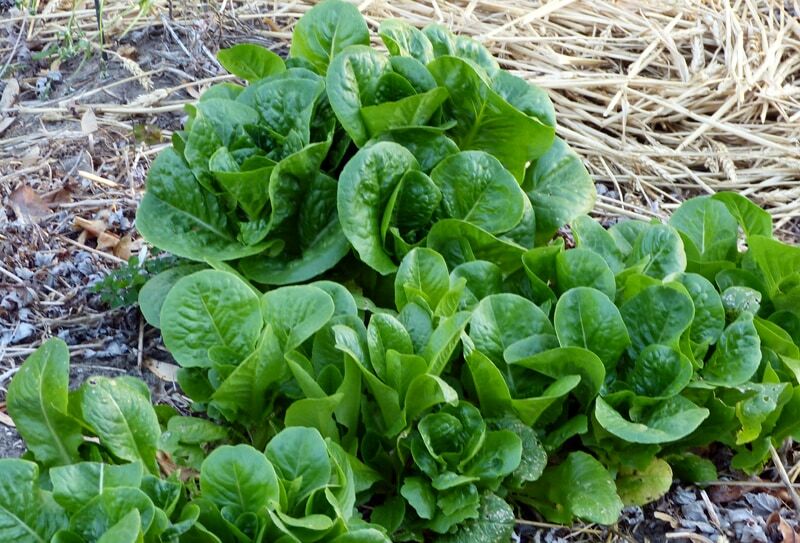 For example: My third planting of lettuce – which was mostly Winter Density – will go in the garden Monday. I’ll start more this week and again before October ends. If the weather allows I’ll start some the first part of November. In many areas (like here in zone 7) you still have time to put more lettuce in the garden. Come January, February, March and April you’ll be glad you made the extra effort. All content including photos is copyrighted by TendingMyGarden.com. All Rights Reserved. I and just about everyone who has checked my lettuce (Little Gem Romain) because of disbelief, are thinking of trying it. I first became interested in playing with it by accident. A few years ago I happened to open a tunnel (because I was too lazy to put away) just before Christmas and found I had edible lettuce! Since then I have experimented with it and keep being surprised. Last year I planted some in a plastic covered tunnel in mid Sept. I had lettuce until just after Christmas, when heavy snow and -20F weather froze the tunnel so I couldn’t open it. When I was finally able to open it in the spring I found edible lettuce and some barely germinated. I’m still playing with method but my advice to everyone – Don’t quit trying, with some help nature does amazing things. Hello and thank you so much for all your gardening advice! I especially appreciate timely reminder posts such as this, that allow us who are gardening in your zone to be able to know what to plant/and or do right now. I have transplanted one batch of spinach seedlings and have some that are about an inch high that were direct seeded, but I have not planted any lettuce thinking it was too late (glad to know it’s not!). Do you happen to have a favorite spinach variety? I planted Tyee and transplanted Bloomsdale Long Standing. I have never had any winter gardening plan, as far as cold frames and the like but think I might give it a try with some windows we took out of our house and replaced. You make it seem so simple. Thanks for your inspiration! My thoughts and prayers have been with you and your husband through this difficult time. I hope he is healing well. Great advice Ray! And by the way Little Gem is a great and beautiful little romaine. I usually always have it in my garden, but didn’t this year. Ronda, your choice of Bloomsdale Long Standing is a good one. I don’t really have a favorite but I like smooth leave the very best because it’s so easy to clean. It all tastes good to me. Thank you for your thoughts and prayers for Bill me. I’ll be posting an update soon. By the way, whether or not it’s too late to plant depends a lot on the weather and of course, we often can’t predict that. Within reason, it’s always worth a try! Nothing lost but a few minutes and a few seeds. Well worth the gamble in my opinion. Just following your link and seeing this now, Theresa. I’ve always admired your photogenic lettuce and this one is no exception. This year I took your advice, and just planted a little seed (in jugs) every couple of days. I have a lot of beautiful lettuce at various stages now as well as kale. For some reason, my spinach got off to a slow start, so perhaps I’ll have to wait until spring for anything to harvest. I agree, nothing lost but a few seeds – so definitely well worth it. Welcome To Tending My Garden! My name is Theresa and I've been organic gardening in Virginia for 40 years. Please stop by often to be entertained, encouraged, and learn things about organic gardening the easy way --- here a little, there a little --- from my stories, tips, anecdotes, experiences, and explanations. $19.97 – Your “book” (PDF format for PC or Mac) will be emailed to you the minute I receive your order. You are invited to visit my other website FlowerBorders.info. If you've benefited from this website please consider supporting it to keep it online and free. Even $1.00 will be of help. Thank you. Learn my simple secrets to successful organic gardening. Subscribe to my mailing list now so you won’t miss any posts or emails from me. Organic Gardening – Cutting Through the Hype to the 3 Keys to Successful Gardening $28.95 Click on the picture to order.